Today is Memorial Day in the United States, a national holiday to remember the courage and sacrifice of American servicemen and women who fought and died for our inalienable rights to life, liberty and the pursuit of happiness. It's also a good day to remember those who have been wounded in the service of our nation and all veterans who live with the memory of those they've served with. To celebrate the day, I've got a Hamilton military deck watch to show you. During World War II Hamilton's production was dedicated to the war effort. It's interesting though that production in 1941 seemed to forecast the dawn of war - as a number of military-oriented time pieces were created. One of the obvious military watches is the Model 22 Marine Chronometer. Marine chronometers were specially made, high quality time pieces for use in navigation and communication. 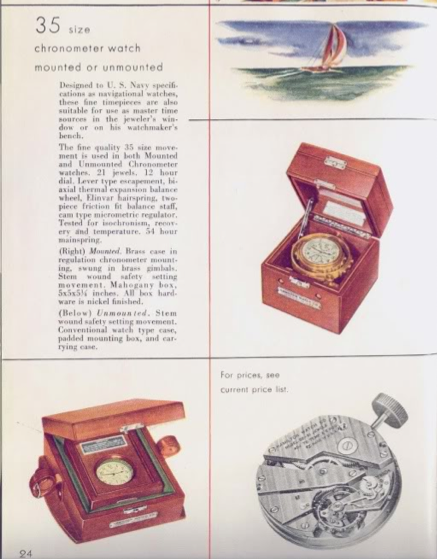 Every US Navy ship had a marine chronometer (or two) as well as comparing watches to synchronize the clocks aboard ship. The Model 22 was produced in a gimbaled version as well as a non-gimbaled version. Hamilton also made a Model 21 with 14 jewels and fusee-design movement. Since the US Navy grew from about 200 ships in 1941 to 6,000 ships by the end of the war - a LOT of marine chronometers were needed. The Model 22 is basically a giant 21-jewel pocket watch. It has a wind indicator, also known as an up/down indicator to show how many hours the watch has run since it was fully wound. In October 2012, I showed the gimbaled version of the Model 22. I recently picked up the non-gimbaled version and there were a number of unique features to it. First off, it's a very early model based on the serial number - only the 1,328th unit made. I've noticed the earlier Model 22's say "Hamilton Watch Co" on the dial, where later models just say "Hamilton". In fact, I had to look at several other watches for sale before I pulled the trigger on this one - just to reassure myself I wasn't buying a "pig in the poke". My watch runs but is really dirty. The plastic crystal is crazed so no amount of polishing will make it look better. The movement has a safety pin-set mechanism so you need to push a little button on the side (between the 10 and 11) to allow the crown to be pulled out to the setting position. You can't accidentally change the time on this watch. The back of the watch says "Bureau of Ships US Navy" and the date 1941 - so this watch predates the attack on Pearl Harbor and America's entry into the war. Under the screw-off back cover is a pop-off dust cover, further protecting the movement. The front bezel unscrews as well and provides access to the dial and hands, just like most Hamilton railroad watches. Unless you're removing the movement, there's no need to remove the bezel. The Model 22 has a very large set lever screw that will release the crown and stem when you loosen it a few turns (just like on wrist watches). Removing the stem will allow the movement to come out of the case after the two case screws are removed. One of the challenges of overhauling a Model 22 is it is way bigger than anything else I work on. So none of my movement holders will accommodate it. I'll have to be very careful handling it so I don't drop it or break anything. Three dial foot screws hold the dial on - just like the other watches you've seen me service. With the dial out of the way, you can see how the wind indicator works - or at least all the parts involved. This is a very complicated mechanism with a lot of small gears to keep track of. I'll show you below step-by-step how to take it apart. First off is the hour wheel in the center that holds the hour hand. The cannon pinion inside of it (for the minute hand) comes off next. By some form of magic, the winding of the mainspring is passed through the main plate from the back to the front through a part called "the differential" - the same sort of device in your car's gear train. The next part off is the differential support cap. It's held on with two screws. That exposes the wind indicator reduction gear and a pinion on the differential shaft. They come out next. Now I've got the dial train cap exposed. One screw, near the center, holds it in place. That comes out next. Now the setting wheels and minute wheel are exposed - they can come out now. You can see on the upper part of the movement the c-shaped safety-setting spring that the pin engages in order to free the set lever and allow the stem to move into the setting position. Two screws hold in place. Now the set cap (or set bridge) can be removed. It has a notched lever to hold the set lever in the setting position or the winding position, depending upon the position of the stem. Two screws hold it in place. Now the set lever and the clutch lever next to it can be removed. I can also pull the two sets of cap jewels in the lower left of the movement. Here are the two cap jewels that contain three of the 21 jewels in the movement. With the movement flipped over - the first thing I will take off is the balance assembly. Even though most of the parts of this watch are large - the balance is still very delicate so I'll get it out of the way first in order to protect it from harm. Normally I take the barrel bridge off first - but this movement is a little different than most pocket and wrist watches I'm used to. So I'll pull the train bridge off next. It's interesting to note that this movement does not say US Navy BU SHIPS on the back - another indicator that this is an early Model 22. The train bridge has a cap jewel over the escape wheel. Notice how the jewel settings are all green - this watch is long overdue for a thorough cleaning. Now the gear train is exposed and can be removed. Next out is the pallet fork and the bridge that holds it in place. Now all that is left is the barrel bridge. The gold-colored setting is the other end of the differential you saw on the front of the watch. I pulled the three bridge screws and will lift the entire assembly out at a single time. Here's the differential assembly - notice the "planetary gear" off to the side. You can see it's pretty dirty. Okay - finally all the parts are removed - just the stem, winding pinion and clutch are left to come out. This movement is way too big for my usual cleaning jars so I'll need to find something big enough to fit the main plate. While everything is being cleaned, I'll install a new plastic crystal. It just pops into place. I was able to get it thanks to Larry at the Military Watch Museum. Give him a shout if you're looking for parts to restore your military watches. He also gave me the confidence to tackle this project - so thanks Larry! Everything gets thoroughly cleaned and then lubricated before being reassembled in the same fashion that I took it apart - just backwards. The balance assembly goes on last and the watch is purring away with good amplitude. The beat error isn't bad - it could be better but I'd rather not goof up the hairspring trying to get the error down below 1. I can tweak the regulator though and slow the watch down slightly. 0 Seconds per day - right on the money, just as this movement ought to run. This movement is way too big for my timer. It's just perched right on top. You can see it's much cleaner now. Here's a better photo of the movement now that it's cleaned and oiled. I didn't want to run it before it was serviced but now it will be a great timekeeper in my office. The case cleaned up nicely too. Here's the dial and hands under a scratch-free crystal. The wind indicator is set to "full" - it will move as time unfolds… 8 hours from now it should be at 8, and so on, until it runs out of juice. Just to put a size 35 watch in comparison, check it out next to my US Navy 2974B Comparing Watch from the same period. It's a 16 Size model and looks tiny by comparison. This Model 22 came with it's inner and outer boxes. The inner box closes to reveal a window that has yellowed with age. I'll replace that later with clear acrylic. The inner box is enclosed in an outer box and secured with a leather strap. This version of the Model 22 was meant for greater portability than the gimbaled version. The US Army used the non-gimbaled version for land campaigns - although all movements are marked US Navy (unless not marked at all, like mine). I enjoyed reading your detailed comments about the mechanism and history of the Model 22. I just purchased a gimbaled Hamilton Model 22, and am trying to find out if it was on a naval vessel. Do you know if Hamilton kept any logs? I don't know for sure but I doubt it. Hamilton sold the watches to the US Govt under various contracts but where they went after that is probably subject to BuShips records, etc. Plus, Model 22 Chronometers were available for sale for decades after WWII through Hamilton's catalogs - so I'm sure there are plenty of examples that never saw military service at all. That thing's a beast! I love it! I notice your watch is a little different from most I see. The dial is marked Hamilton Watch Co. and the balance is gold colored. Do you know at what serial number these were changed? Thank you for wonderful information here. I just purchased a gimbaled Hamilton model 22 and was wondering if there is a way to freeze the second hand to make the setting more precise? Thanks. No, the Model 22 doesn't "hack".